But the idea in this book, the transformation is really fundamental and he writes in such a relaxed, but passionate, way that it is like having a really inspiring conversation on a long-haul flight (or from a climate/innovation perspective preferable, a high-speed train trip). I should start by saying that there are a number of things I disagree with, and I find it a little sad that he address current economists in the way he does, as I think it does not add to the book and will not convince any of the old school economists. But maybe it was worth a try… But it is not important (as old school economists are not very important in setting the agenda for the coming transformation, more than the fact that they delay action in important areas). The theme of the book is automation. Not simple automation, but transformative automation and it asks the question what happens when better intelligence and better machines are merged. What jobs are needed and what jobs are not? In a time where policy makers, media, business and NGOs all agree that anything should be done to create almost any jobs Martin takes a step back and ask, where are we heading with the current development? The conclusion is simple, and not surprising when you look around at the real world development: It is very likely that there will be a lot less available jobs than we usually assume. Especially when intelligence (different forms of AI's) is improving at an accelerated phase challenging many of the white color jobs that no one is discussing as disappearing (doctors, lawyers, investors, etc). People that today spend a lot of time with things that are not very creative. If we moved from labor intensive work to more thought intensive work with the help of mechanical machines during the industrial revolution, what is the next step…? I would hope creative and ethic lives… So two shifts are needed, first that we don’t focus on simple “thinking”/doing" as machines will do the simple things for us, and second that we need to look beyond “jobs”and ask what kind of lives we want people to be able to have in society. I’m particularly interested to see how the increased need to create "domestic" jobs in EU and the US will accelerate the transformative trend with jobs lost in existing sectors. Both EU and the US now agree that they should have a manufacturing base as an important part of the economy, but neither seems to understand that the option they have to be competitive is to accelerate the trends Martin describes. There are interesting discussion in this book I hope anyone talking about “job creation” and “green tax reforms” will read, as well as anyone with a general interest in the future. I bough the e-book on Amazon as I think this kind of approach should be supported and that the big distribution channels must allow the multiple distribution approach by Martin. Why, because he is making the book available for free, or at the cost you are willing to pay, on his page. So to sum up. It is a book looking in a direction where few dare to look and doing so without being sensationalistic. 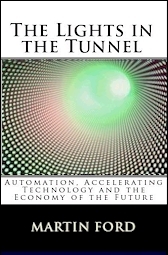 So if you are interested in how the society could evolve before the laggards start realizing that their models are out dated I think you should pick up, pay for if you can afford it, and most important, read “The lights in the end of the tunnel”.